MIAMI (AP) — After his father was diagnosed with cancer, a 15-year-old Champaign, Ill., teen started skipping school, erupting in angry outbursts, yelling at teachers and punching holes in walls or retreating to his room paralyzed by an overwhelming sadness. When the teen’s assistant principal approached him a few months ago about seeking help for mental illness, the student initially declined, saying he didn’t need it. However, eventually he did seek treatment. Diagnosed with major depressive disorder, he joined group therapy sessions at his school. As stories about increasing school violence dominate headlines, experts say many teens are struggling with untreated mental illness. However, even though federal health officials recommended universal mental health screenings for students nearly a decade ago, they still aren’t required. An Associated Press review of policies around the nation shows screenings vary widely not only from state to state, but within each school district. There’s no consistency on whether the schools screen, what age they screen and what they screen for. “We have (schools) screening for all kinds of rare infectious diseases and then we don’t screen for common behavioral disorders that are costly to the individual, the family and society in terms of health care utilization, crime cost and high risk of death … it doesn’t make any sense from a public health perspective,” said Mike Dennis, of Chestnut Health Systems in Normal, Ill. He teaches clinicians in 49 states how to assess and treat patients with mental illness and substance abuse. Although the 15-year-old Illinois student was not diagnosed through a school program, in his school-based group therapy he’s learning practical tips to identify his triggers and calm them before emotions spin out of control. “I think it is a good idea because a lot of people think they don’t need help but they actually do,” said the teen, who is not being identified by The Associated Press because he is a minor. The federal government does not keep track of school mental health screening, so it’s all but impossible to say how many schools do or don’t offer it. The offerings vary from intensive services to virtually none at all. “No state is providing high-end services in all of their schools,” said Sharon Stephan, co-director of the Center for School Mental Health, a national organization based at the University of Maryland that provides training for schools and mental health providers. Baltimore and Chicago have robust screening and treatment programs. Teachers in one South Florida school district screen children as young as kindergarten by filling out a short questionnaire, while students in Minnesota answer anonymous surveys about drug use and depression. In Olympia, Wash., 21,000 students were screened for substance abuse and mental health issues in 2010, but that dropped to only 7,500 in 2012 due to lack of funding. Mental health issues typically start during adolescence. If left untreated, they can lead to substance abuse, school drop outs and difficulty maintaining steady jobs and relationships. Yet many people are not diagnosed until later in life when they don’t have access to services because they don’t have health insurance or their insurance doesn’t cover it. The U.S. Surgeon General reports that 10 percent of children and adolescents suffer from serious emotional and mental disorders that significantly affect their daily lives. However, offering mental health screening in schools can raise other complex issues. Some warn that mass screenings will over-diagnose students and stigmatize them with a life-long label. “People have to be very cautious when they are talking cavalierly about screening these kids. How do people feel if they are over-identify or under-identify? … The consequences to that are big,” said Linda Juszczak, president of the School-Based Health Alliance, a group that advocates for school clinics. Some also say mass screenings could uncover mental health problems that schools lack resources to treat. “Once we screen and assess and discover the need, I think it’s our responsibility to have the resources in place to service every one of those needs that are uncovered,” said Denise Wheatley-Rowe, of Behavioral Health System Baltimore. The organization developed a system that has gained national recognition using a team of school officials and community mental health experts to target students most in need. The program has grown from four schools to more than 100 in the past 25 years. It helps nearly 7,000 children a year at all grade levels through prevention and early intervention treatments. The team identifies children who may need help based on factors like whether they have a parent in prison or who struggles with substance abuse. Before children enter middle and high school, the team scans data for those struggling academically and behaviorally, including those with high truancy or suspension rates, and then offers individual counseling or family therapy based on the student’s need. In South Florida a fourth grader was involuntarily hospitalized for a week last August after threatening to attack a teacher’s face with a pencil and throwing chairs and overturning tables in the classroom. The child, who was diagnosed with oppositional defiance disorder and anxiety, was placed on medication and returned to school with a case plan. A counselor is also working with his mother on parenting skills. Dr. Seth Bernstein, a psychologist who consulted on the case, called it a missed opportunity. The child was never screened for mental health or behavioral issues because screenings weren’t offered at his school when he was there. A program that offered academic support and family counseling, employing four dozen mental health experts had been cut at his school and 69 other elementary schools in Palm Beach County a year earlier. 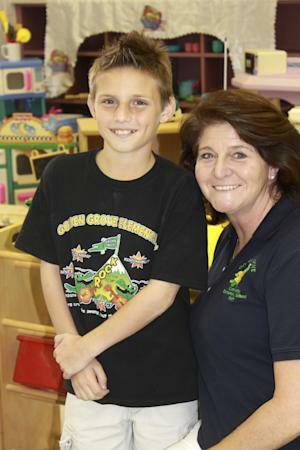 In contrast, Matthew Palma, 10, attended play sessions as a kindergartener as part of Primary Project, which screens 3,000 kindergarten and first-graders in Palm Beach County each year through a one-page assessment completed by teachers. 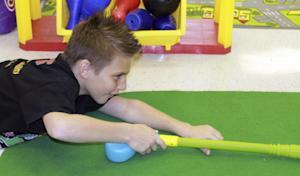 About 650 are referred for play sessions. Children with less severe issues, such as trouble expressing themselves or making friends, attend play therapy weekly for three months. Children with more serious issues are referred for other services. The program, which costs $560,000 a year, is in 12 schools — about 10 percent of schools in the district — but program leaders say they get daily requests to expand. Matthew’s mother, Susan, says his confidence improved dramatically and the now fifth grader isn’t afraid to talk to adults or raise his hand in class. She agreed to let him be interviewed for this story. “It’s basically just to screen them for potential social, emotional, behavioral issues. Some of them may be some false positives. You may miss some kids, but it gives kids that upper chance of being identified and getting services early on before it’s too late,” Bernstein said. However, even when services are offered, some parents are reluctant. Michelle Anderson said her son’s third grade teacher at a Davenport, Iowa, elementary school referred him for a mental health screening in the community, where a psychiatrist diagnosed him with attention deficit hyperactivity disorder and prescribed the 8-year-old Ritalin. She eventually took him off the medicine after she said he repeatedly came home from school sobbing and overwhelmed. She pushed the school to instead test her son for learning disabilities and found he had a problem organizing information. She asked for extra help in the classroom, but she said the school refused. Earlier this year, officials at a different school again recommended that her now 15-year-old son seek psychiatric treatment. He was prescribed the antidepressant Prozac, but she never filled the prescription after her pharmacist warned of side effects for teenagers, including suicidal thoughts and hallucinations. “It just seems like they want to medicate rather than provide education support,” said Anderson, who is now home-schooling her son. She asked that the AP not use his name because he is a minor. Researcher Rhonda Shafner contributed to this report from New York. This entry was posted in news, repost and tagged behaviour, college, disorder, doctors, medication, mental health, parents, psychiatry, school, screening, treatment, USA by Takao K. Bookmark the permalink.